We were in NY last weekend to visit family and wanted to make the trip to Albany to see the Tri City ValleyCats. I can say that no team has been more supportive of us and our efforts than the ValleyCats. Two years ago, Michelle Skinner sent us several packages including lots of old card sets, bobble heads, t shirts, and other fun team stuff. 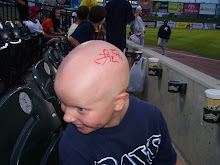 The coolest thing she did was get the ValleyCats and Finnigan's Sports Cards to team up and make a donation to NAAF from their card sales. 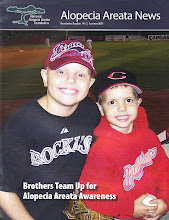 We went to go see the ValleyCats and get one of those big checks on the field in August of 2011 when THIS happened. While we never made it up there then, we knew this was our chance. We were going to go on Friday the 5th but the team announced that #1 draft pick, Mark Appel, would be making his professional debut. While it would have been cool to see him pitch, there was a slight problem. 1. It would be PACKED! 2. Pitchers don't sign autographs on the days the pitch. We really wanted to try to get his autograph, so we waited until Saturday to go...Good choice! On our way there, Michelle called and said they had Tommy John there speaking to fans about ALS. While he would go out for the first pitch, he wanted to let a kid throw it for him. Michelle let Gavin and I throw out the first pitch for Tommy John. Most kids only know Tommy John for the surgery, but Gavin and I already knew him. He was the manager of the Bridgeport Bluefish from 2007 to 2009. It was fun to talk to him about the Atlantic League and the time he spent visiting Lancaster. After the pitches, we got to stand down on the line for the National Anthem. Mark Appel came out to line up with the team but we thought it might be too late. We asked Michelle if we could get his autograph real quick after the anthem and she said yes. Mark was very nice and signed a ball for Gavin and I. The game was about to start so we didn't ask to get a picture with him but the autographed balls are awesome! The ballpark is really nice and very family friendly. We loved the speed pitch...I topped out at 51 and Gavin topped out at 44. Kyle loved Southpaw...and Spiderman. It was superhero night so he kept wanting to go see Spiderman. It was a beautiful night and good to finally get to meet Michelle and thank her for all she and the staff have done for us! They are a first class operation! Thanks again...we will be back! So cool to land Appel's autograph!